The researchers built these devices by combining different pieces of DNA into one long stretch. The DNA is then put into cells that convert it to RNA, a slightly different version of genetic material that is frequently made by cells. The RNA molecule can then be read like a recipe by the cell’s protein-making molecular machinery. The sensor-actuator devices are built with efficient redesign in mind. Each piece of the device, whether the sensor or the protein-recipe actuator, can be swapped out for another version. This way, researchers can conveniently build a device to fit their particular needs. The sensor part of the RNA molecule can detect proteins that communicate information gathered inside and outside of the cell into the nucleus, which acts like the cell’s control center. Smolke and her team used the molecular devices to sense disease-like states, such as inflammation and cancer, in cultured human cells. The RNA sensor-actuator devices can “listen in” on the messages communicated by the cell and act accordingly. Depending on whether or not the device binds to the input protein, the RNA molecule could keep its original structure, or cut out a piece of itself and thus change the genetic information it contains. When the RNA is read by the cell’s protein-making machinery, the final product will depend on the RNA’s information content. The process by which the RNA device can remove part of itself is called “alternative splicing.” Alternative splicing is an everyday process for many cells and is a powerful way to generate a diverse array of proteins inside a cell. In the sensor-actuator devices described in the study, the optional piece of the RNA that could be cut out contained a “stop” message that instructed cells to stop making a protein before it was complete. When this “stop”-containing piece was removed, the device produced instructions for a whole and functional protein, one that, for instance, could glow green. In this way, the device could alter its output based upon the state of the cell. “This is the first time a sensor-actuation device has been developed to respond to protein inputs and control an alternative splicing event linked to gene expression,” said Smolke. One such therapeutic effect is the ability to specifically kill diseased cells. The researchers engineered an actuator module with an output that converted an inactive drug into an active form that causes cells to die. 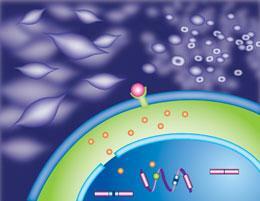 The sensor-actuator device only made the drug-activating output protein when the cell was diseased. Otherwise, the “stop” signal was left in the device and acted like a safety trigger preventing the death of healthy cells. But the power of alternative splicing is not limited to just functional and non-functional outputs. “Instead of just yes/no, alternative splicing could modulate function,” said Smolke. Proteins could be modified to have slightly different functions in response to different cell states. “There’s a lot of richness in alternative splicing that could be used to develop more complex genetic circuits, beyond the demonstrated examples, that we might begin to implement in human cells,” she said. The study was funded by the Caltech Joseph Jacobs Institute for Molecular Engineering for Medicine, the National Institutes of Health, the U.S. Department of Defense, the Alfred P. Sloan Foundation and the Bill and Melinda Gates Foundation.